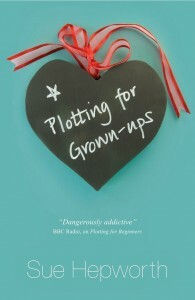 Sue Hepworth’s new book, PLOTTING FOR GROWN-UPS is being launched next Tuesday. I thought I’d interview her and this is what she had to say: How far do you draw on your own experiences in your books? In other words, are you Sally Howe? ‘I always draw on my own life in my books, but I am not Sally Howe, even though she does share many of my writing and publishing experiences. She is a kind of alter ego, I suppose – but she’s less complicated, more optimistic, sunnier, less politically conscious, and she is not a Quaker (which I am. )’ Who are your favourite authors? ‘Carol Shields – for her fluid writing and her analysis of ordinary lives; Garrison Keillor – for his humanity and humour and his perceptions about American small town life; Sebastian Barry – for the powerful emotions and poetry of his prose; Helen Dunmore’s novels – for the poetry and sensuality of her writing, Nora Ephron – for her perceptive wit, sharpness, and humour.’ What do you like to do when you are not writing? ‘Walking and talking with my husband, cycling, playing the tenor saxophone, patchwork, gardening, laughing, knitting.’ Describe the room where you write for us. ‘The walls are painted turquoise and the room is sunny and light. I have a window onto the front garden – to the south – and one opposite, looking onto the back garden. Above my desk hang four landscapes by a Wensleydale artist called Piers Browne, and an oil painting of cows in dappled sunlight. The latter was my father’s. Although I love the Peak District where I live, my heart is in Wensleydale (in North Yorkshire.) On the windowsills there are stained glass pieces that my husband made; and the tops of the bookshelves are full of family photographs. Next to my computer is a photograph of my mother, who died five years ago, but whom I still miss.’ Sue’s book launch is at Hassop Station Bookshop, near Bakewell, Tuesday, 24th September, 7-8.30 pm. Free wine and nibbles. Open to all. I’ll be there. This book by pyschoanalyst, Stephen Grosz, has been widely reviewed and deservedly so. When it arrived from the London Library, I opened it to flick through it and read the odd page, and that was it, I was hooked. I read it more or less in one sitting, drawn on by the enticing titles: ‘How lovesickness keeps us from love,’ ‘On being boring’ ‘On secrets.’ Grosz explains that the episodes described in the book are a distillation of more than 50,000 hours spent with patients, though of course some of the details have been altered. And distillation is the word: these are short pieces for the most part, and they are in a sense little detective stories in which the psychoanalyst assists the patient in uncovering what lies behind their unhappiness and inability to change their behaviour. They reminded me a little of Raymond Carver in the directness of the writing and in the humanity of the teller. I loved this rueful insight in ‘Why parents envy their children’ where Grosz points out that this kind of envy can also apply to teachers and pupils, and even psychoanalysts and patients: ‘sometimes our patients are younger, brighter and financially more successful than we are. And it is not all that unusual that a psychoanalyst can help a patient solve a problem that the psychoanalyst himself has been with struggling unsuccessfully in his own life.’ I don’t want to say too much about individual stories as that would spoil them for readers, but I found them thought-provoking and moving. This is a book that many writers would find it useful to keep on their shelf. It arrives through my letter box every month or so in its neat transparent wrapper. It’s the perfect size and weight – better even than a Kindle – to slip in my handbag for emergency reading. I encounter old friends in its pages and read work by writers new to me. I like the old-fashioned feel to the cover and the fact that it actually has illustrations. It’s a treasured survival from the golden age of short story publishing, but it also has a great blog, somethingisgoingtohappen.net, written by the editor, Janet Hutchings, and guest contributors. So I love it as a reader, but perhaps I love it even more as a writer. I’ve just had a short story accepted (the one that’s a kind of riff on the locked room theme). It only took six weeks from submission to contract. They pay a proper fee and they pay it when you’ve returned the contract instead of waiting for publication. Every Christmas a card arrives from New York signed by the editor and her assistant, and when one of my stories was short-listed for an award Janet wrote me a personal letter. It’s a beacon of light in a publishing world where good manners are too often in short supply. In my previous post I wrote about a book I was reading when I was nineteen. It was a wonderful time in my reading life, when I read voraciously: WAR AND PEACE, ANNA KARENINA, CRIME AND PUNISHMENT, quite apart from the books that I was required to read for my English degree.I used to be so moved by them, so caught up, touched, amazed, shocked. It’s been a long time since I was swept away like that by a novel but it happened this summer, when I read Vasily Grossman’s LIFE AND FATE and was moved to tears. It has to be one of greatest novels of the twentieth century. Completed in 1960, it was confiscated by the KGB, only the second time a book was ‘arrested.’ The other book was The Gulag Archipelago. Grossman died in 1964. The novel was smuggled into the West and published in 1980. Set around the time of the Battle of Stalingrad, it is a panoramic novel, describing the lives of one particular family, but spreading out far beyond it to encompass many viewpoints, not just in a Russian labour camp, but also German concentration camp, and takes us behind both the Russian and the German front lines. Grossman drew on his own experiences both as a war correspondent and on a more personal level. Victor, one of the central characters, is riven with guilt over the death of his mother, whom he failed to get evacuated before the German invasion. This was Grossman’s own experience as was an episode when a grenade lands between a soldier’s feet and fails to detonate. It sounds like a sombre read, and it is, but there are flashes of humour, comedy even, some of it is bitterly ironic. Grossman brilliantly describes the psychology of those caught up in the workings of a totalitarian state, the convoluted thought processes through which the betrayal of friends and ideals can be justified. And the novel is also deeply moving, most of all in the section on the journey and arrival at a German death camp of a childess woman doctor and a solitary six year old boy. She turns down a chance to save herself when doctors are taken out of the line, so that David won’t go alone into the gas chamber. LIFE AND FATE is a truly wonderful novel, a genuine masterpiece.